"John is very courteous, pleasant to be around. Completely..."
"The crew that performed the work on my house impressed me..."
Would like to have the crawl space looked at. The crew that performed the work on my house impressed me beyond my expectations. 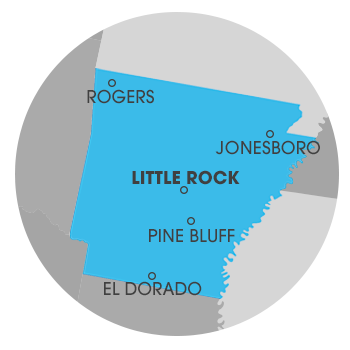 We all know the havoc that the conditions throughout Arkansas can wreak on your home. Whether you're suffering from a moldy crawl space or a leaky basement, Crawl Space Solutions of Arkansas stands ready to solve all of your problems. We are the leading experts in the services that we provide, and offer lasting solutions that are assured to solve and prevent any future issues with your basement or crawl space. We also work with innovative products that have a proven track record of success throughout North America. All of our specialists are highly certified and equipped with the best training possible, and are guaranteed to leave your home better than it was before. Above all else, your satisfaction is our top priority. If you're in need of any of our services don't hesitate - contact us today for a FREE, no obligation estimate in Blytheville, AR! If your crawl space is experiencing issues such as rot, mold, or structural problems, it's imperative that these issues be addressed immediately to further prevent them from spreading to every part of your home. Some symptoms of crawl space problems include foul odors in the home, uneven floors, drywall cracks in the interior, or an experience in heightened allergies or asthma symptoms. Not only will our innovative products such as our vapor barrier and thermal insulation eliminate these problems, but also create a healthier living space that will help you save on your utility bills and gain valuable storage for your home. As a member of CleanSpace, we have access to Basement System's® proven Research and Development department that's constantly testing and searching for the best products and solutions for crawl spaces around the country. While other companies might try to sell you on inferior basement waterproofing solutions, Crawl Space Solutions of Arkansas has the developed and patented solutions you can count on. Our products work together to a create a fully functioning waterproofing system that's specifically tailored to your home. All of our sump pumps, energy efficient dehumidifiers, and more have been used in thousands of homes throughout North America. This customer called explaining they had water coming into their crawl space and they did not know if it was getting out or just sitting under the home. Upon inspection, they found that the water was just puddled up in the crawl space floor. This water was causing the humidity under the home to rise and created a great space for mold and mildew to grow and thrive. Our crew wanted to stop this from happening before it affected the homeowner and his family. The crew started by grading out the crawl space to get rid of any holes that water could sit in. Sometimes these holes are created by pests and rodents that get under the home. They then put down drainage matting, the drainage matting has dimples in it that create a pathway for the water to travel if it gets underneath it. The water was directed to a SmartSump, these are specifically designed for crawl spaces. The SmartSump pumps the water from the crawl space in a specially designed to not let any moisture escape the pump to keep the crawl space as dry as possible. They also installed an IceGuard so water can pump out of the crawl space even in freezing temperatures. The crew also installed CleanSpace to ensure that there is no moisture that comes from the crawl space floor. A dehumidifier was also installed to control the overall moisture of the crawl space, if this moisture level is too high it can start to affect the living area above. To ensure that the customer does not have this problem like this again they sealed off the crawl space from the outside elements so there is no chance for water to get into the crawl space.